Get directions to our San Mateo location. 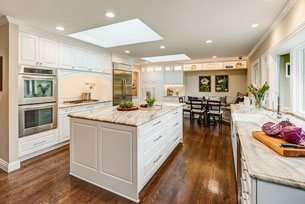 Gilmans Kitchens and Baths has been serving the local community for 35 years, bringing extensive design and remodeling experience to our clients in San Mateo and throughout the Bay Area. We offer a wide array of home remodeling products, specifically geared towards the kitchen and bathroom, and other spaces of the home, such as mudrooms, entryways, hallways, and home offices. In addition to specializing in kitchen cabinets and bathroom vanities, custom cabinets are also offered for other rooms in the home. Accessories such as countertops, hardware and plumbing products are also offered. If you live in Belmont, Burlingame, Foster City, Half Moon Bay, Hillsborough, San Carlos, or any of the surrounding areas, visit our showroom today! We offer services that range from large to compact, in order to satisfy each client’s needs. Kitchen cabinets are the largest, and often, most striking feature of a kitchen. 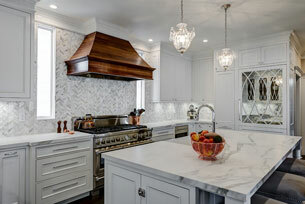 With Gilmans variety of custom and semi-custom cabinetry options, you can create the kitchen of your dreams! Our remodelling team can help you choose from various cabinet colors, textures, door styles and brands. Our wood finishes range from traditional woods such as Oak, Cherry, and Mahogany, to contemporary options like Bamboo, and Macassar Ebony. Upgrade your San Mateo home with beautiful kitchen cabinets from Gilmans Kitchens and Baths. Gilman's Kitchens & Baths had a large display of available cabinets and countertops. Kathy Smith took her time and showed me different price points and combinations of cabinets and quartz- and never lost patience when I changed my mind! My calls were always answered or returned promptly and while my indecision was obvious Kathy allowed me to think things over. At no time did Gilmans Kitchen & Bath fall short of my expectations. At Gilmans, we help our clients design and create the relaxing bathroom of their dreams. Our highly experienced designers help you choose from bathroom countertop and cabinets options to fit your style and budget. We offer various bathroom vanity styles to fit either a small bathroom or a luxurious master suite. From traditional cabinets such as Cherry or Mahogany, to more modern styles such as Bamboo or acrylic, we have a wide selection of wood finishes to accommodate all styles. Visit our San Mateo showroom to get started. I have recommended Gilmans Kitchens and Bath on several occasions and I know several who have gone on to recommend Gilmans themselves. If there is something wrong or unclear, Gilmans works with you to fix it and make sure everything is right. I never expect that everything can be perfect all the time, but a company who recognizes when something is wrong and works hard to fix it earns my respect and recommendation! bathroom or kitchen remodel, creative solutions, and possible options, to meet individual styles and budgets. Each of our designers undergo intensive training and continued education within the design industry to stay up-to-date with the latest styles, trends, and technology. My experience with Gilmans was excellent. Everyone I dealt with was professional and courteous. I was extremely happy with the product I purchased, and the staff at Gilmans gave me the information I needed to make an informed choice. They were able to handle multiple balls in the air and I was able to trust that they would come through on everything promised. Gilmans Kitchens and Baths works on kitchen and bathroom remodels, as well as new construction and additions. Clients are able to hire their own independent contractors or use the Gilmans Install Only service to install the cabinets purchased from one of the four showrooms located throughout the Bay. For a fully customized remodeling experience, customers have the option of using the Design-Build service, where Gilmans Kitchens and Baths would serve as the licensed contractor. Our highly skilled team of designers, coordinators and internal crew of installers would take the project from concept to completion. Our Handyman Service is offered to clients who have smaller projects that they need help with. Whether it is a small project or a large scale one, Gilmans is able to provide homeowners with what they need for their kitchen or bathroom remodeling projects. If you live in Belmont, Burlingame, Foster City, Half Moon Bay, Hillsborough, San Carlos, or any of the surrounding areas, visit our San Mateo showroom! Call (630) 340-2890 to schedule an appointment with one of our designers to get started on the home remodel of your dreams. San Mateo and the surrounding areas have been hugely impacted by the recent fires. We extend our condolences and our hearts go out to all who have lost family, friends, or their property. While first responders and firefighters have bravely fought to reduce the affected areas, we understand that some individuals have lost everything they own. If you have been a victim of the recent fires in the San Mateo area, we have designers ready to help you through reconstruction. As a gift from us, we’d like to offer you special pricing to help you through these trying times. 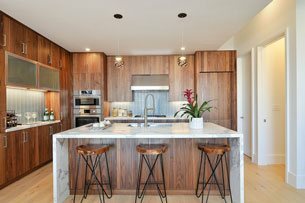 How much does a kitchen renovation cost in San Mateo? On average, kitchen renovation costs in San Mateo range from $75K to $140K, depending on the size and scope of the project. Other considerations like the type of materials used, customizations, special additions or upgrades, as well as the location of the home can affect costs. A bathroom renovation or remodel in San Mateo will most likely cost around $24K to $70K. Differences in cost will be determined by style and budget. With a wide array of options to choose from, bathroom remodels can vary widely. Want to get an idea of the costs of your next bathroom renovation or remodel? Call us to get started!. 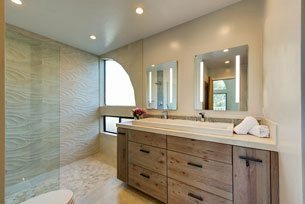 How much value does a bathroom renovation add to San Mateo homes? In San Mateo, upscale bathroom remodels or renovations will generally cost around $70K with a 94.9% return on investment. This is only a rough estimate as the cost will vary depending on the size and scope of your project. Ready to get started? Call us Today to speak to one of our designers.